Posted by Jonny Greenwood on 2/15/2019 4:48:33 PM. A significant advantage of eBook reading device is the capacity, even with a basic version of Kindle, you can hold thousands of eBooks with this handy size device. But every coin has two sides, after finishing and archiving more and more books, the storage space will become more and more disordered. When you need to spend minutes to find the book you want to read, it is high time that you cleaned your ebook shelf up. 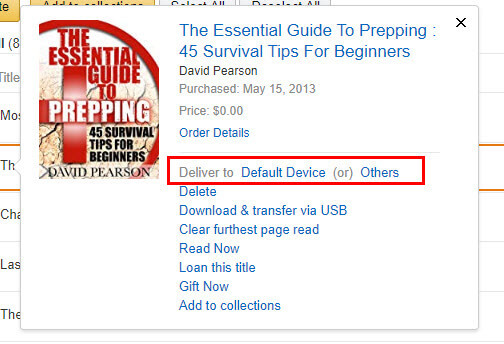 Before cleaning your Kindle up, you should know what kind of deletion do you need. 1) You have downloaded too many books and finished most of them, now you want to make your Kindle looks clear and clean, delete those finished books from device but keep them in cloud. 2) Your device was lost or stolen, or you want to re-sell your Kindle, then you need to remove them from that device. 3) You just want to delete books from Kindle unlimited, you can return a Kindle Unlimited title. 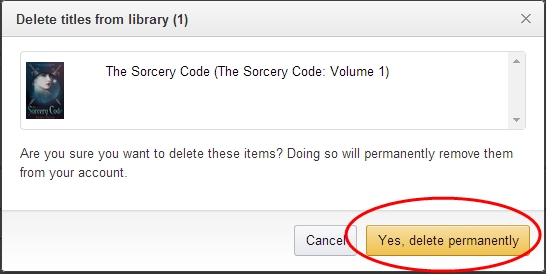 4) You even don't want to see those finished books in archive, want to permanently delete them from Kindle Cloud. Click the links above you can jump to the part which can solve your problem. This is the cheapest model in Kindle family at the moment which only costs you $69, what a bargain! I bet you will never regret to have it. To free up space on your Kindle, you can archive items by selecting the item’s name on the Home screen and pressing the Left Arrow on the 5-way controller. Select remove from device, and press the center of the 5-way controller. 1. If you are not already on the Home screen, press the Home button. 2. In the list of the content already on your device, move the 5-way to underline the item you want to remove. 3. Move the 5-way to the left to remove the item. 4. 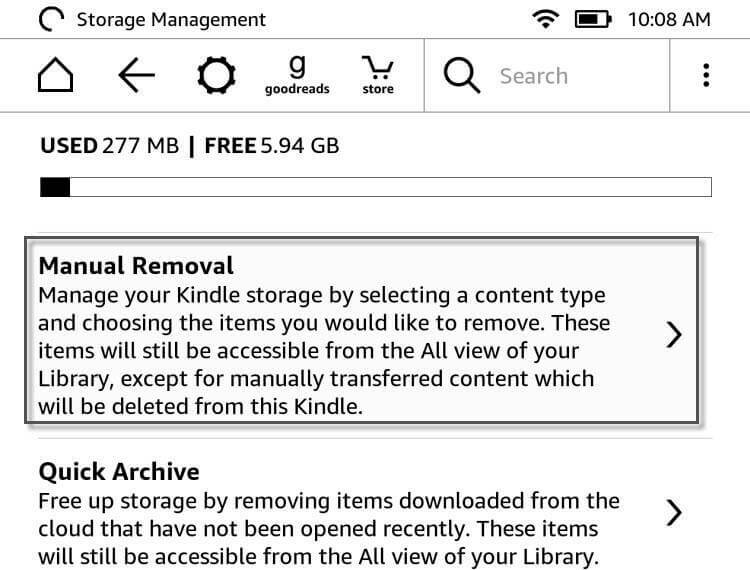 For books purchased from the Kindle Store you will see “remove from device” and for all other content you will see “delete”. Press the 5-way to remove the content. To change your mind, move the 5-way up or down to cancel. Note that Kindle books are backed up for you at Amazon even if they are removed from the device. It's not complicated to delete books from Kindle Voyage, you just need to press and hold the title which you want to remove for one or two seconds, When a menu pop up, select "Remove from Device", then the book will be deleted on your Kindle Voyage. If you want to read this books again, you can download it from Kindle Cloud again. If you want to delete a recent book Kindle Oasis, go to your home screen, otherwise head to your Library/search box to find the title(s) you want to get rid of. Just press and hold the name for a couple seconds until a box appears with a list of options, select “Delete This Book”. The content transported to your Kindle Oasis via USD will be deleted permanently in this way. But you can still resync the delete books purchased from Kindle Store or Pushed to Kindle via email. 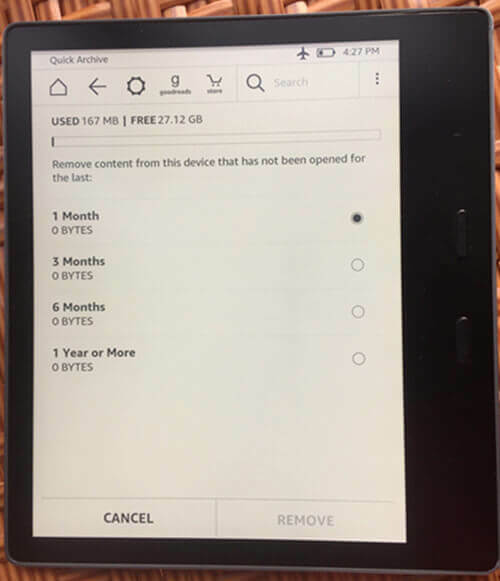 To delete books from Kindle Fire, simply press and hold on an item to display the contextual menu, then select Remove from Device. How to re-download books to Amazon Kindle? Books still exist somewhere on Amazon cloud though they were removed from your device. So it's possible to re-download them onto your device. On the home page click on "MY LIBRARY". Then choose "ALL" button in the top-right corner, and select the book you wish to re-download. 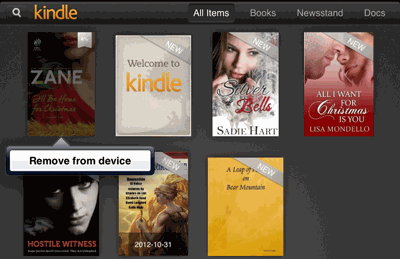 Of course you can also re-download your Kindle books through your Amazon account. From "Manager your Content and Device" tab click the "Actions" button, select the "Deliver to Default Device or Others" option. Since 11 November, 2017, Amazon rolled out a new Firmware Update 5.9.2.0.1 for its Kindle ereaders. Kindle Oasis 2 (KO2), Kindle Oasis (KO), Kindle Voyage (KV), Kindle (Kindle 7), Kindle (Kindle 8), Kindle Paperwhite 3 (KPW3) and Kindle Paperwhite 2 (KPW2) support with the new firmware. The new Firmware allows you delete Kindle books in batch. To delete Kindle books in batch, you need to go to Home — Menu — Settings — Device Options — Advanced Options — Storage management — Manual Removal. Then You can manage your device storage by choosing the items you would like to remove. Or you can also to go to Home — Menu — Settings — Device Options — Advanced Options — Storage management — Quick Archive to quickly remove content from this device that has not been opened for the last 1/3/6 months, 1 year or more. Amazon adds storage management to the new firmware, though it’s a small function, it’s really convenient for Kindle users who need to clean their storage frequently. Compared to Manual Removal, Quick Archive will easily your beloved content by accident. If you can’t remember all the contents in your kindle local disk, please don’t try this method. If you want to delete books from Kindle devices in batch, please upgrade the firmware to 5.9.2.0.1 version. You can update software firmware to 5.9.2.0.1 version on your Kindle device or download Firmware 5.9.2.0.1 from Amazon. Notice: All the methods above just delete the books from your device and archive them to your cloud, if you want to delete them completely, you need to remove them from Kindle Cloud. To remove content from your Kindle app which installed on Android device, you need to enter the application at first. Then you are in the home screen and there displays your books. Now find the book you want to remove from your cellphone in the app, tap on and hold on the book you want to delete, then choose "Remove from device" (the last option). You can see the screenshot on the right side. You can delete books from your iPad, iPhone or iPod touch so you don't have to use your device's memory space to store them. To remove individual book from the Kindle for iOS app, simply tap and hold the cover of the book, and then tap "Remove from device" which in fact is the only choice for you. Tips: For a book synced from cloud, the pop out choice is "Remove from device". For a book only exist on your device, it will be "Delete permanently". And for all iOS 7 version Kindle app, there will be an extra "Add to Collection" option. Content that is purchased from the Kindle Store is archived and can be re-downloaded at any time; sideloaded content and personal documents that are not archived in your Kindle Library are permanently deleted. 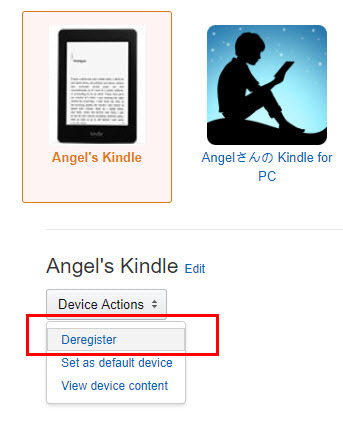 When we want to re-sell our Kindle device, or the Kindle device is lost or stolen, the safest way to protect our contents is to deregister our device from Amazon. Go to "Manage Your Content and Devices" page, then select the "Your Device" tab. Here you should see a list of the devices that you have registered to your account. And then, choose your device. Once selected, it will have an orange outline and a pink background, and shows the device's name below it. Click on the grey button "Device Actions" and from the list click "Deregister". Please keep in mind that this will remove all the contents from your device. You are not able to download or buy any more until your device is registered with another Amazon account. With Kindle Unlimited we can borrow books (up to ten books) but no need to pay for them. But once finished reading, they will be still saved in our account. In this situation we can delete them from Kindle Unlimited history. 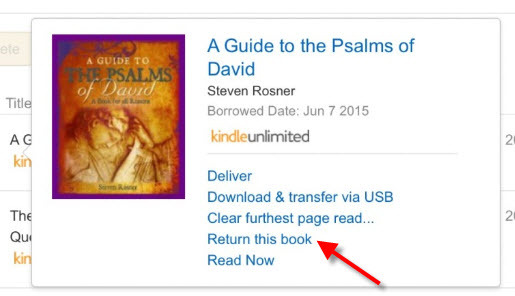 You just need to "View My Kindle Unlimited Library", and then "Return this book". 1. Kindle Unlimited allows you borrow 10 books at a time. So if you borrowed over 10 books, you will be asked to delete one of the books in Kindle Unlimited. 2. Books will be gone when you cancel your Kindle Unlimited subscription. Before you do this, please make sure you understand that if you delete a book completely from your Kindle Cloud, you will not be able to read it any more unless you purchase the book again. Tips: In other words, you are giving up your ownership of this book by deleting it from your Kindle Cloud. It is still not too late to give up this decision. Alright, if you reach this part, I can see you really have a pretty strong mind to clean up your Kindle archives. Now let's remove contents from Kindle Cloud completely and permanently. 1) Login to Amazon.com and go to "Manage Your Content and Devices" (Formerly "Manage your Kindle") page. In this page you can see all the items in your Kindle Cloud, which means they can be synced to all your registered Kindle devices and apps. 2) Select the books you want to delete, and then click on "Delete" button. 3) Then it will pop up a warning window to let you make sure. Click "Yes". Finally, you have deleted this book completely, you are not able to see the book in either your device or your cloud any more. I should sress this point again that if you removing kindle books with this method, no way of retrieving them. This means that you have to purchase for a second time if you want to read them someday or read them on other Kindle again. Still want to delete kindle books from your Kindle account but need a back-up? Please use Epubor Ultimate tool which helps remove the drm limitation from your Kindle books and back up them to your computer (or other usb drive). Thanks so much for posting this, it is really helpful to have all the instructions for a variety of devices in one place and I appreciate the time you put into this. I always delete my books from kidle management, but some of the books stay on my ipad. When I tap them they just want to know if I want to download.. If you keep a book on the device, and directly delete it in Kindle Library Management page, then the book on your device will not disappear. But if you delete a book on both device and Kindle Library Management page, you are not to able to download it again. So to delete an item from both the cloud and the device, you need to delete it twice? In the article above it says if you delete from the cloud it will disappear from the device also. Thank you for the information on this. I have been looking for a way to delete some duplicate documents I had in my kindle app for quite some time and I appreciate the detailed walkthrough. I did as instructed and removed about 8-9 books from my archives (cloud?) now I have fewer MG left than I did before I deleted them What is happening? And you also need to delete them on your device. And make sure you hadn't sync other contents. Delete books definitely won't take more space. I really appreciate your doing this as my Kindle app on my iPad was getting kind of trashy/messy looking. However, you may want to make a note of the following: as I was deleting titles from my device page I noticed that the dialogue box that popped up said something different than what you quote here. It said: "Delete Permanently" over "Add to Collection". As I was only deleting samples and one (horrid) book that I got by mistake I opted to click on Delete Permanently. You might want to check this out. It could be different post OS 7. If the book is synced from your cloud library, then you will see "Remove from Devide". If the file doesn't exist in the cloud but just on your device, you will see "Delete permanently". However, I will explain this in the article. Thanks for your feedback. This method works for deleting books, however the cloud version is left behind on machine. How do you remove the book icon from a Kindle Android. The cloud icon indicates the book is still remain in your Kindle cloud library. If you want to get rid of it, please refer the method about deleting kindle books permanently. This article helped where others simply confused. Not being able to get rid of a horrible book is beyond irritating for a book worm like me. Using the steps given I was finally able to joyfully delete the waste of space from my library, iPad and Cloud once and for all. Thank you for taking the time to write this. You'd think this was a silly thing to spend any time on at all; esp. since most people are at least partly computer savvy. Well, I'm pretty techno-literate and it was driving me NUTS that I could NOT find a way to quickly and intuitively delete a book from the Kindle App I downloaded to my iPad Air. Thank you for solving this so elegantly. Thank You very much, it worked this time ,I don't know what I did before,but thank you again very much. I just wanted to say thanks for this article! I had a ton of Loan Ended letters on my Kindle Paperwhite from when I get library ebooks from OverDrive. I could not figure out how to get rid of them! I'm so pleased to have all those annoying things gone! It took a long time to remove from the device but it really does work. Thank you, there's been some books that I brought by accident that I couldn't delete off the cloud until today. This is definitely amazing. I need to delete library borrowed books from iphone using Kindle app. They were returned on amazon site with MMC, but still on iphone cloud. Not on computer to remove again. When I hold down on iphone to delete from cloud, I do not get a remove or delete from device prompt. Only recommend, download, details, add to collections. I have read previous posts. Still can not remove from cloud. Suggestions? Thanks so much for posting this! It helped a lot. Thanks so much for the help.I have 3 Kindle's and I have like 2 to3 thousand books on them and I could not figure out how to erase them. But with your help I am cleaning them up so I can add some more. I read a book in about 3-4 days. I love books and I love my Kindle's. Thanks so much. I followed all directions posted on all of my devices and under the Manage My Content section on amazon but I STILL had the deleted book covers showing up on my kindle for PC app. When I left click it only gives me the option to purchase the book or to add it to a collection, which I don't sort my books by collection anyhow. I tried right clicking and then hitting the delete button. Nothing. Wiped all kindle books off my laptop and emptied the recycle bin. Still no change. This has been an issue for me for years literally. I had given up. I decided to google around for a solution today and still could not get the covers off my app. The PC app has changed over the years but currently under Library you see ALL and DOWNLOADED. I had removed all books from my laptop and so under downloaded I had 0 but under ALL I had 101. I only actually own 41 kindle books. The rest are book covers from library ebooks I have checked out and have now expired and I have either used the return feature under manage my content or for expired books used the delete for ever option. STILL these books are on my PC kindle app. FINALLY I stumbled upon a solution. The images are cached under the appdata file. I got all the 'ghost' content off my PC by deleting the cache file. Then I opened the app and re-synced. SO step by step: 1. Find your Kindle XML File named "KindleSyncMetadataCache.xml"
"YourUserName" will be your username on your computer. 2. Delete the file. It will regenerate when you next open and sync the kindle app. Now your PC kindle app will match whatever you have in the cloud. THANK YOU!!! I've been looking everywhere to figure out how to delete a book from my "old" Kindle! This is the only site that gives you detailed instructions per device! Glad to know that your problem has been solved!